There are only 10 days remaining until zombies scuttle, shamble, and skulk through Dover, and here in the Dover Zombie Walk Fast Action Response Bunker (located safely 20 floors below sea level), we’re taking a few moments to recognize the hard work and ravenous appetites of other zombies (and zombie accomplices) we have known. First up is Patrick Cochran (who you can find on the interwebs here), the righteous dude who designed this year’s bitchin’ Zombie Walk poster. Patrick’s a stand-up guy who apparently can convince pretty ladies to dress up like zombies at the drop of a hat. No Halloween season in the NH Seacoast would be complete without the Portsmouth Halloween Parade, so please visit their site, make a donation, come to one of their many awesome events, and–most importantly–march in the parade on Oct. 31! Which next brings us to this year’s Portsmouth Thriller Dance, a slightly more coordinated, musical answer to the Zombie Walk. If you are a zombie and posses any amount of dancing ability, hook up with these folks and get yer MJ on during the Portsmouth Halloween Parade. And finally, if you, for whatever reason, dislike zombies and would most like to see them truly dead (not just undead), then please join the Manchester Zombie Defense Corps (organized by the dudes at Double Midnight Comics in Manchester). The MZDC will teach you all about killin’ zombies and other important post-apocalyptic tips. 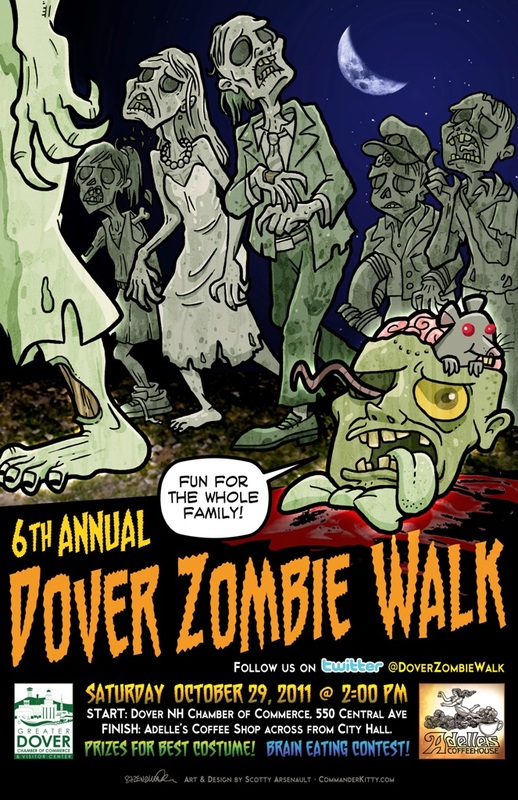 The final version of this year’s Zombie Walk poster will be up soon. Until then, stay hungry.